The long-awaited Foundation Update for No Man’s Sky is finally here, bringing with it features that really should have been in the game from Day One. The update brings base-building, survival mode, freighters, and stackable items. Now, when you stumble upon a desolate outpost, you can build your own base on it, which can be upgraded with new housing, hydroponics, research, and storage buildings. If all goes well, you’ll start to attract alien settlers who bring their own skills to your new society. As your stockpiles of resources begin to swell, you’ll want to schlep them across the galaxy to other bases and trade terminals. Which is where freighters come in. These celestial Boeing 747s are bought at great expense, but it’s arguably worth it as they allow you to move the goods you’ve sourced from place to place. 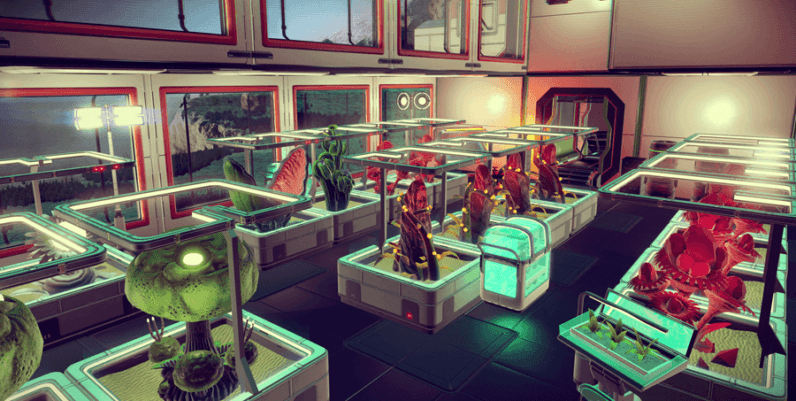 You can even customize your vessel to grow crops while onboard. Oh, and did I mention you can now stack items five times per inventory slot, meaning you can carry more stuff? Handy. Survival mode is another exciting development. When enabled, it promises to transform the relatively sedate pace of the game into something that promises to challenge and frustrate. Expect fewer resources and stronger, bolder adversaries. No Man’s Sky was probably the most anticipated game of 2016, but many who bought it were ultimately disappointed by gameplay that was repetitive, and quite often did not match what was advertised. This Foundation Update is a bit of an olive branch to these pissed-off users.